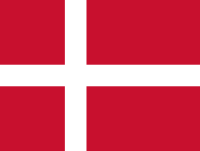 The naitional banner o Denmark, Dannebrog, is reid wi a white Scandinavian cross that extends tae the edges o the banner; the vertical pairt o the cross is shiftit tae the hoist side. The cross design o the Dens banner wis subsequently adoptit bi the ither Nordic kintras; Swaden, Norawa, Finland, Iceland an the Faroe Islands, as well as the non-Nordic Scots regions o Shetland an Orkney. Durin the Dens-Norse personal union, Dannebrog ("Dens cloth") wis an aa the banner o Norawa an continued tae be, wi slicht modifications, till Norawa adoptit its current banner in 1821. Dannebrog is the auldest state banner in the warld still in uise bi an independent naition. Prior tae the uise o Dannebrog, Dens forces are kent tae hae uised the raven banner. ↑ Glenday, Craig (2009). Guinness World Records 2010: The Book of the Decade. Jim Pattison Group. p. 119.